and I must have walked many miles during my time there. through to get to the other side. would end up, so I try not to chance it. thing: she held out her hand and invited me outside. 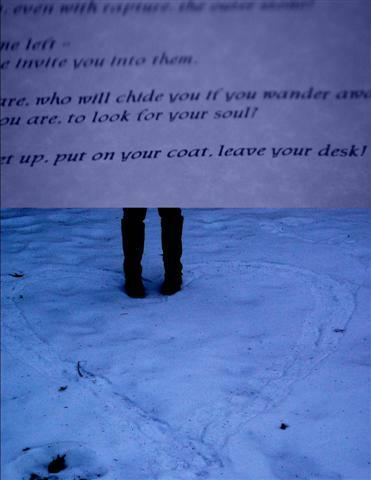 these hearts in the snow. would spend the rest of the evening. gravity on the way to whatever awaits outside. … and I feel like it might be possible. Beth when I stopped teaching, I vowed to myself that I would never again have a job where I could not just walk out the door at any time. I have kept that vow and have learned that it is those little bites of what I call “runaway time” that sometimes make my day.